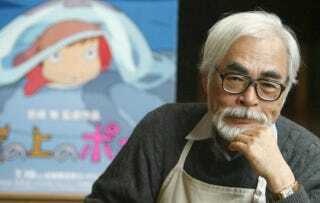 Hayao Miyazaki, co-founder of Studio Ghibli and director of such films as Spirited Away, My Neighbor Totoro, and countless other masterpieces, has announced his retirement from feature films. Okay, sure, Miyazaki has been retiring sporadically ever since he finished Princess Mononoke in 1998, but it's been a while since the last one, and for some reason this just feels like it's going to stick. He's 72, he's definitely slowed down, and his last few movies haven't felt as... vital, I guess, as his earlier work. I'd be delighted for this to be another time he proves himself wrong and drags himself out of retirement to take over some Ghibli movie for himself, but even if he doesn't, he leaves behind a legacy of anime movies that will never be equalled. The news was announced by Ghibli president Koju Hoshino at the Venice Film Festival yesterday, although there will be a more formal press conference next week.